rotherham business news: News: Wentworth Woodhouse perfect for Britain's "Darkest Hour"
News: Wentworth Woodhouse perfect for Britain's "Darkest Hour"
Tipped for Oscar success, Darkest Hour, is released in the UK this week and Rotherham film lovers may recognise that the Buckingham Palace shown on the big screen is in fact much closer to home. That's because interiors of Wentworth Woodhouse in Rotherham were used in the making of the new Winston Churchill biopic. Focus Features reteamed with both Working Title Films and director Joe Wright (known for Atonement & Pride & Prejudice) to tell the story of the Churchill immediately after his appointment as Prime Minister. The Wentworth Woodhouse Preservation Trust (WWPT) last year concluded the acquisition of the largest privately-owned house in Europe for £7m and is working on plans for a sustainable business case for its secure future. Featuring in numerous big screen and small screen productions has been important in raising the profile (and much needed revenue) of the property which for many years has been in relative obscurity. The house stood in for Buckingham Palace in the television adaptation of King Charles III and was also used in ITV's prime-time drama, Victoria, which became the channel's highest rated drama of 2016. For Darkest Hour, Oscar frontrunner Gary Oldman plays Churchill having spent around 200 hours in the make up chair. Production designer Sarah Greenwood is also being tipped for an Oscar nomination. As plans for the redevelopment of Wentworth Woodhouse are in their infancy, the fact that previous owners had been unable to afford to carry out much-needed repairs meant that interiors lent themselves perfectly to the wartime drama. 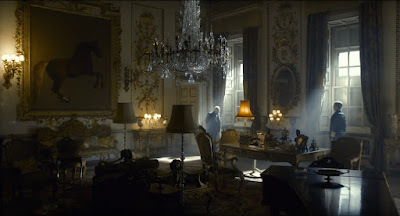 Sarah Greenwood, production designer on Darkest Hour, said: "For Buckingham palace, we used Wentworth Woodhouse in Yorkshire because it has this really tired air. It was perfect in capturing how even Buckingham Palace was struggling under the weight of the war. The gilding was all tarnished and sooty. It hadn't been painted in some 50 years. It had that air of neglect. "We put up these massive shutters at the windows and we upholstered the furniture in fabrics that were not glitzy or lovely — it was very tawdry." The replica of George Stubbs' painting of Whistlejacket, which hangs were the original once did at the Grade I listed building, has also been refreshed. Indeed, filmmakers commissioned a completely new copy to make it look better on screen. With Wentworth Woodhouse standing in for Buckingham Palace, iconic scenes show King George VI (played by Ben Mendelsohn) inviting Churchill to become Prime Minister. Oldman is seen walking through the Pillared Hall, Marble Saloon and into the Whistlejacket room. On "meeting Winston Churchill" at Wentworth Woodhouse, Mendelsohn said: "One of the first scenes we did was when he was walking up the corridor to become Prime Minister. And it was one of those things where you phase. It was like the old magic eye trick – where you look at something and then you see something else. But that was what it was like." Darkest Hour is in cinemas now.